When people talk about Hillary Clinton’s political strategy for the remainder of 2016, two questions tend to dominate: How much further should she “pivot” to “the left” to bring Bernie Sanders’s challenge to a close and unite the Democratic Party? And then at what point and how rapidly must she “pivot” to “the center” to win swing voters in the general election? Some analysts combine the two questions: Will Bernie Sanders force Clinton to “move left” when she should be “moving to the center”? If all this hypothetical “pivoting” and “moving” makes you a little dizzy, how must it seem to voters whose main concern about Hillary Clinton is that she seems a tad too calculating and inauthentic — in a word, phony? Not so good. And since it’s these personal characteristics, and not her positioning on an ideological spectrum, that are arguably the biggest source of her relative unpopularity among general-election participants, perhaps she should keep that pivot foot un-planted. That will be easier said than done, of course. By all accounts Bernie Sanders is planning to make ideological concessions from Clinton in the party platform or the general-election campaign agenda the principal object of his “revolution” once he’s forced to give up any claim on the nomination itself. To a considerable extent the actual number of concessions may be less important to Sandernistas than the perception that Clinton is bending the knee — yet that is precisely the perception she needs to avoid. Anything she can do to accommodate herself to Sanders and his supporters as early and as inconspicuously as possible will reduce the grinding and clanking sounds of a Clinton-campaign “pivot” in the glare of publicity before and during the Democratic convention. And the sense that she is a gracious winner willing to go the extra mile to unite her party, not a cross-pressured machine politician struggling to keep it all together, would be invaluable in reinforcing the impression that she is a strong and confident figure whose principles are not for sale or rent. In addition, getting through the Democratic convention without some perceived “move to the left” will mitigate the clamor for a compensatory “move to the center” afterward. But the clamor will nonetheless exist and could be a siren song. If, for example, a significant number of Republican opinion-leaders are still resisting Donald Trump by the end of both conventions, a conspicuous “pivot to the center” by Clinton might keep some of them on the fence and bring others over to a high-profile “Republicans for Clinton” effort with significant public-opinion value. Still, the high road for Clinton will be projecting herself as someone who doesn’t need to “pivot” to become clearly preferable to the abrasive and erratic Trump among swing voters, especially in such key demographics as white women, where she will enjoy an important advantage from the get-go. This could be the rare general election in which sharply distinguishing herself from the other party’s candidate equally serves the interests of mobilizing the Democratic base and attracting swing voters. If late-deciding voters approach Election Day with doubts about what either candidate actually believes or would attempt to accomplish as president, it should be Trump inspiring those doubts. 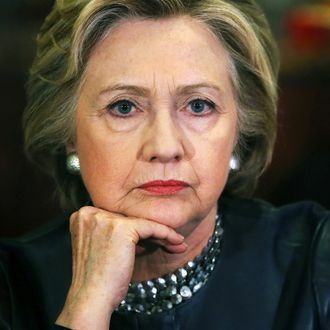 The less “pivoting” and moving and signaling Hillary Clinton does before then, the more likely it is that she will finally seal the deal with a majority of the American people and win the presidency with a renewed sense of purpose.